Hiya champs! Welcome to our final post on locating elements. Yay!!! This is a continuation from our previous post, “9n. WebDriver – Locating elements: Part 4a (by XPath)”. You have heard me say this before and you will hear me say it again… read Part 4a before going any further for a complete grip on using XPath strategies. These techniques along with the ones we saw in part 4a, can be combined and used to form an effective XPath that can locate any element on the web page. Time to walk through today’s techniques with examples. This is an easy way to locate elements by providing the text exactly as it appears on the web page. Watch out! You might bump into ‘ElementNotFound’ exception even if a space is included by mistake. It is very important that the text being provided in the code matches the visible text exactly and I mean that literally! Example: Let us locate the ‘Forgot account?’ link on the Facebook Sign Up page. Let us locate this link by providing the text as it appears on the Facebook page. If you wish to locate all elements containing a partial text, contains() and text() techniques can be combined. All elements can be obtained in a list using findElements method. Let us try to implement both contains() and text() in the same example. Since we just have one link with that text, findElement method will be used. Starts-with() can be used to find an element by specifying a partial value (prefix) of the attribute. This function comes handy when attribute value changes dynamically on page reload. Example: Let us locate the ‘New password’ text box on the Facebook Sign Up page. <input class="inputtext _58mg _5dba _2ph-" data-type="text"
Let us locate this textbox by providing the ‘type’ attribute’s partial prefix value, ‘pass’. Notice that the password field in the ‘Sign in’ section also has ‘type’ as ‘password’. Hence the second element has to be located in our case. XPath axis defines a node-set or the direction which is to be considered with respect to the current node as it navigates through the tree structure of the DOM. The below table (courtesy: w3schools) shows all 13 XPath axes that are available along with their results. Selects the parent of the current node. Example: Let us locate the anchor tag of Facebook logo present on the top left of the Facebook Sign Up page. The parent node ‘a’ with href and title attributes will be located. Example: Let us locate the text ‘Birthday’ on the Facebook Sign Up page. ‘select’ tag with id, ‘month’ is chosen. Navigating to its ancestor div tag with class, ‘_5k_5’. Then to its preceding sibling node with ‘div’ tag that has ‘Birthday’ as the text. This particular example is chosen to show that multiple axes can be combined to achieve the desired result. Example: Let us locate the ‘Log In’ button on the Facebook Sign Up page. The child node of the label with id, ‘loginbutton’ – input tag with id, ‘u_0_q’ is located. Example: Let us locate the ‘first name’ text box on the Facebook Sign Up page. The descendant node of ‘div’ tag with class, ‘uiStickyPlaceholderInput’ – input tag with id ‘u_o_1’ is located. Example: Let us locate the ‘log In’ link in the footer section of the Facebook Sign Up page. The following sibling of td tag with class, ‘_51m- hLeft plm’ – is another td tag whose child is an anchor tag with title, Log into Facebook. Combined following-sibling and child axes to locate the ‘Log In’ hyperlink in the footer section. 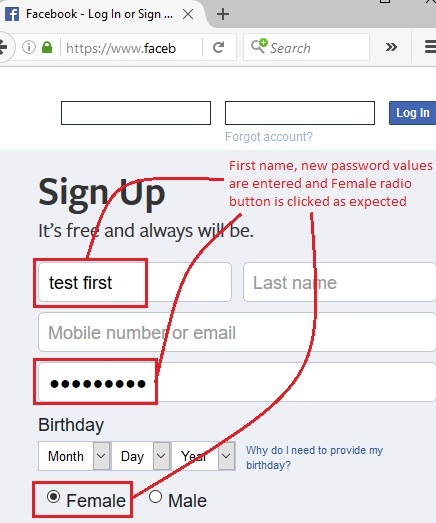 Example: Let us locate the ‘female’ radio button on the Facebook Sign Up page. The preceding sibling of ‘label’ tag is the ‘input’ tag of type, ‘radio’. Thus the required radio button is located. With that, some of the commonly used XPath axes types are covered. BrainBell – Attention! Pay attention to the state of your brain. Symptoms: nothing getting registered, starting to skim the post or forgetting what you just read. Diagnosis: Your brain is overloaded. I would personally suggest Pomodoro technique based on my experience. It is highly effective. Just give it a try! In JUnit window, green bar shows that the test case is executed successfully. Console window shows the absence of any errors. It also shows all the printed results as expected. Well there it is! You should be all caught up on locating strategies for now. We will be seeing these strategies being applied in all our upcoming examples. So keep watching this space for more. See you again in another post! Have a great day!